'I Walk The Line' This classic of American music made the country and the pop charts in 1956, and pretty much set the sound for the Man In Black. Johnny Cash walks inside the gates of Folsom Prison, preparing to perform his fourth concert for inmates there. For a lot of people, there's one voice that defines American country music. That's the voice of Johnny Cash. He's been performing and recording for nearly 50 years, and every so often, a new wave of young music fans discovers him. It happened again just recently when he released an album that included songs by Soundgarden and Beck and other rockers. Suddenly, Cash was hailed as hip. But that was hardly news to people who've been listening to Cash since the 1950s. Johnny Cash had his first big hit in 1956. "I Walk the Line" made the country and the pop charts, and pretty much set the sound for the man in black. It also influenced the course of some younger musicians' lives. cotton farmers, kept strips of green hickory smoldering in the smoke house day and night. In his autobiography, Cash wrote that, `The scent of hickory smoke is another memory gone deep in my bones.' And that smoke seems to have gone deep into his voice, too. But if you ask Johnny Cash's fellow musicians to describe `the voice,' they reach for loftier words: `the voice of truth; of wisdom; of thunder; of America; something ancient, ageless, from the bowels of the Earth.' Singer and songwriter Rodney Crowell has his own take. "Johnny Cash's voice--you know, if Mt. Rushmore could open its mouth--any one of the sculptures on Mt. Rushmore could open their mouths and sing, that's what it would sound like." "As an adult, I've really given it some thought about what music before could this song have derived itself from? I couldn't find it in Roy Acuff's music or Jimmie Rodgers because it was a folk format that those songs came from. Yet this song, it was almost like jazz. It was almost like the Southern white man's version of Charlie Parker, in a way. It was just completely turned around and disassembled, and he's modulating down. The chords are changing and he's going up and down. And it--normally with a modulation, you would just start in a lower key and modulate up a half-step or a full step. But he started out by modulating down and then modulating back up. And `I keep a close watch on this heart of mine'--I mean, that's very interior kind of--that's sort of soul searching in a way, if you think about it. And at that time in the '50s--this was pre-Bob Dylan. And, you know, it's sort of existential in a way, you know. `I keep a close watch on this heart of mine. I keep my eyes wide open all the time. I keep the ends out for the ties that bind.' It's poetry, you know, and it's pretty high-level poetry, really, in my humble opinion. If you read enough articles, interviews and liner notes, you can try to piece together the story of what inspired "I Walk the Line," but Johnny Cash is a masterful storyteller. And even his good friend Kris Kristofferson has said he's half-truth, half-fiction. The humming at the start of each verse? Cash said he picked that up from Dr. Hollingsworth, a physician in his hometown who was always humming. Then there's lyric, `I keep my eyes wide open all the time,' which Cash said was based on a piece of advice from a Dale Carnegie business course. And the melody line? Well, in his autobiography, Cash explains how when he was in the Air Force in Germany, he put a tape up on his reel-to-reel recorder and heard a, quote, "haunting drone full of weird chord changes, something that sounded like spooky church music." It turned out the tape was a recording of his band, the Landsberg Barbarians, but it was being played backwards. "I had a conversation with Johnny the other day," Rodney Crowell says. "And we were talking about when he was in the military--he was in the Air Force. And his job in the Air Force, he sat with headphones on trying to pick up, I think, German Morse code. And, you know, when Morse code's running through the headphones, and he's, you know, pulling his eight-hour shift. I said, `Man, that's sounds to me like--that's where your--(makes guitar noises)--sound came from.' And he said, `It absolutely is.' He said, `When I first started writing songs, I was kind of keeping a little notebook and scratching things around with Morse code running through my head.'" When Johnny Cash came back from the Air Force, he moved to Memphis, where he worked as a door-to-door appliance salesman. He started a band with Luther Perkins and Marshall Grant, two guys from the local car dealership. They wanted to record a gospel record with Sam Phillips. He was the hottest producer in Memphis, the brains and ears of Sun Records. He helped create Elvis Presley's sound, Carl Perkins' sound, Jerry Lee Lewis' sound. `Sam Phillips was the man to see,' Johnny Cash told "Fresh Air's" Terry Gross in 1997. "So I called him, and he turned me down flat. And then two weeks later, I called him, turned down, turned down again. He told me over the phone that he couldn't sell gospel music. So I went down with my guitar and sat on the front steps of his recording studio and met him when he came in. And I said, `I'm John Cash. I'm the one who's been calling. And if you listen to me, I believe you'll be glad you did.' And he said, `Come on in.'" Cash recorded a few singles with Sam Phillips. And not long after, he went on the road opening for 20-year-old Elvis Presley, who was already on his way to becoming, well, Elvis. And wherever Elvis went, of course, adoring girls were sure to follow. Johnny Cash was 23 and married to his first wife, Vivian Liberto. On tour, Cash met temptation, and that is what led him to write "I Walk the Line." It is a proclamation of fidelity. "It was kind of a prodding to myself to, `Play it straight, Johnny,'" Cash said of the song. Cash originally played the song on the slow side. "Well, Sam wanted it up--you know, up-tempo. And I put paper in the strings of my guitar to get that--(makes guitar noises)--sound. And with a bass and a lead guitar, there it was. Bare and stark that song was when it was released. And I heard it on the radio, and I really didn't like it. And I called Sam Phillips and I asked him please not to send out any more records of that song. But he said, `Let's give it a chance.' And it was just a few days until--that's all it took to take off." The song became a huge hit across the country, and the line Johnny Cash tried to walk in his personal life got tougher. "Hmm. Fame was pretty hard to handle, actually. The country boy in me tried to break loose and take me back to the country, but the music was stronger. And the temptations were women, girls, which I loved, and then amphetamines not very much later. Running all night, you know, in our cars on tour and the doctors got these nice pills that give us energy and keep us awake. So I was taking the pills for awhile, and then the pills started taking me." Johnny Cash's struggles with his dark side became legendary, but they never seemed to lose him any fans. In fact, they became part of his allure, Rodney Crowell says. "Johnny Cash is a great combination of Saturday night and Sunday morning all rolled into one,"
And both of those things are there in "I Walk the Line" if you listen hard enough, says Rodney Crowell. Because while the song can seem on a very listen like a declaration of commitment, there's another message embedded, that things could be otherwise. "You know, before "I Walk the Line," it would have been summed up as `I'll be true to you,' you know, or something a little more Hallmark. But with him it's, like, `Because you're mine, I walk the line.' It's just a—you know, the razor's edge is just sharper." 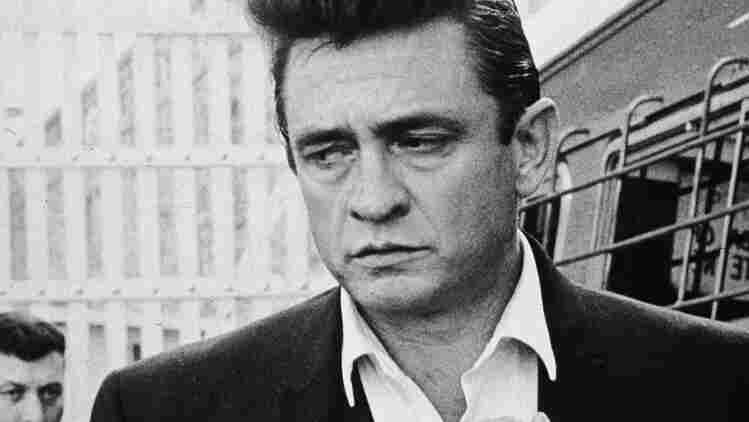 The edge is even sharper in some of Johnny Cash's other songs, songs about drunks, killers and other not-so-upstanding guys who struggle with their demons but are never demonized. That hasn't always made Johnny Cash popular with country music radio programmers who tend to play it safe and not offend. But Cash hasn't ever bowed. He's pretty much just made the music he wants to make. And as Rodney Crowell sees it, Cash, by his example, has given the phrase `I walk the line' new meaning. "I mean, it can be a lot of things, you know, integrity and courage, you know, the courage of your convictions. And certainly, Johnny Cash has stood for that kind of integrity and that kind of stick-to-your-guns mentality." "I Walk the Line" has had such a huge impact on Rodney Crowell's songwriting and on his life, that he's recorded a tribute to it, a song called "I Walk the Line(Revisited)" featuring a special guest. At one point when Rodney Crowell was writing this song, he had all the verses finished and he had a melody for the chorus, but no words to go with it. When he realized that the words to the original song would fit his melody, he called Cash and asked him if he'd sing on the tune. "So when he showed up at the studio, we sat down and I started teaching him a new melody to words he had been singing for 40 years. And he went along with this for about--you know, for a short period of time. Then he kind of fixed me, you know, with a stare and said, `Son, you got a lot of nerve changing my melody.' And for the first time when he said that, with the kind of gravity only Johnny Cash could have, I kind of realized the audacity, you know, of I'd been basically been painting a moustache on the "Mona Lisa." But Cash was a good sport, Rodney Crowell says. He is, in the end, a deeply spiritual and generous soul, as well as a man you wouldn't want to mess with, a man who has lived on both sides of the tracks. In fact, the house Johnny Cash grew up in in Dyess, Arkansas, was right up alongside the tracks. It would be hard to order up a better metaphor.